Lucknow: BJP’s saffron-clad 5-time MP, Yogi Adityanath was today administered the oath of office and secrecy as Uttar Pradesh Chief Minister by State Governor Ram Naik at Kashiram Smriti Upvan at an impressive ceremony attended by Prime Minister Narendra Modi, BJP chief Amit Shah, Union Home Minister Rajnath Singh and veteran ruling party leader L K Advani. 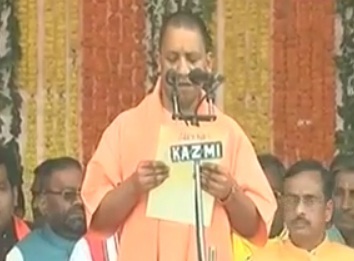 Adityanath heads a 47-member council of ministers that includes two deputy CMs -BJP state unit chief Keshav Prasad Maurya and party’s national vice president Dinesh Sharma. Besides the Chief Minister, the deputy chief ministers are neither members of the the legislative Assembly nor the Legislative Council. Besides the two deputy CMs, there are 22 cabinet ministers, 9 ministers of state with independent charge and 13 ministers of state. Former Cricketer Mohsin Raza, is the sole Muslim representative in the new Uttar Pradesh Council of Ministers. The ruling BJP found it hard to include a Muslim in the Adityanath team as not a single MUslim had been fielded by the BJP in the just concluded Assembly election.